A group of low-ranking real-estate salesmen are trying to survive in a cut-throat office culture. But when two of them devise a plot to redress the company's wrongs, the resulting turmoil increases the pressure to unbearable levels. A 1984 Pulitzer Prize winner for Drama. Directed by Eric Simonson. Recorded by L.A. Theatre Works before a live audience. I found it a bit challenging to follow some of the twists and turns in the story towards the end. That's not surprising as it is a play and if I had been watching it instead of listening while driving in rush hour traffic, I could have better segregated the characters and their actions in mind. I did not take off any stars on that score, but may try to locate a copy of the movie just to get things straight in my mind once and for all. 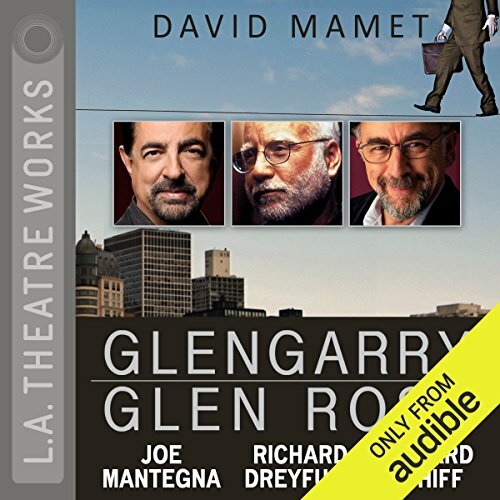 Where does Glengarry Glen Ross rank among all the audiobooks you’ve listened to so far? High, I am a fan of the three leads and it was great to hear them all together in this. Each are fine speakers and all had great performances in this. Done in front of a live audience this protection took me there and in my minds eye I could see each of them there in front of me. A great performance. Would you listen to Glengarry Glen Ross again? Why? Yes. I feel like there's more to be gained through a second listen. It's short, so it's not a major task. First up, the performance was excellent. I wish I could have seen the stage production after listening. As for the story, that suffers from the time constraints that a play imposes. It seems like the book is just getting going when it ends. The subject matter itself is a little on the week side. It highlights the cut-throat atmosphere of high pressure salesmen, but this is a segment of society whom with anyone would have a hard time empathizing. A short listen, I recommend you give this version a try even just to experience the full cast performance. I've never seen this play produced, but I have seen the movie so I was prepared for the strong language and palpable anger in the dialogue.......and these performers do a wonderful job. The anger and fear is almost palpable among the salesmen of a real estate development as they struggle to sell properties to feed their families and rank higher than their coworkers on the sales board each month, so they can get better sales leads the next month to try and hustle to earn enough to feed their families again. If you've never listened to a live performance it might take a bit to get used to the sounds of the audience applauding, for instance, but it's worth it to hear this great script and great performers. but I missed the Alec Baldwin character even though Rumor Has It it was ad-libbed for the movie. excellent casting even without Jack Lemmon. For what this is, it isn't bad. I've mentally compared this to the film with the all-star cast. These actors are top notch, but the film cast was top top shelf. I'd be better off just grabbing the full film audio track and listening to that. I really enjoyed this one. The performances are spot on, with the actors perfecting the timing of the dialogue. A careful listener probably could follow this audio version without familiarity of the play, but I would recommend watching the wonderful James Foley movie for an introduction (assuming there isn't a readily available live version nearby). That being said, much like Shakespeare, it's a delight to hear a new version of the show for those of us who are already familiar with the material. There's a lot of screaming and profanity as well as some casual racism and sexism, particularly in the end, but anyone who's been around this much testosterone has probably experienced something similar. The actors chew the scenery, and are working with strong enough material to support the big performances. Overall, though, I enjoyed this because the play has a good rhythm, and takes the listener into an interesting world, telling a simple, but entertaining, story along the way. It's a great piece of drama and this is an excellent performance of it. Much better if you're already familiar with it. This was well done -- the performances were on point, but it's much better if you already know the play so you'll understand the entrances/exits. It's a lovely production. Some of the voices are a bit close in tone. A casting thing. Could be better cast.